Unfortunately, as we all know, the healthcare reform bill was passed without the Stupak-Pitts Amendment preventing public funding of abortion. Although pro-lifers fought hard and the American people made it clear that they did not want their hard earned money going toward abortion, those in power in Washington did not listen. This is not the time to give up. Those leaders who stand for life in the Nation’s Capital are still fighting. 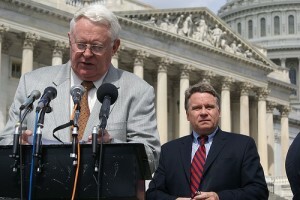 Congressman Joe Pitts, ardent pro-life Representative from Pennsylvania’s 16th District, recently introduced H.R. 5111 the Protect Life Act which prevents federal funding of abortion and protects conscience in the health care bill. As of today, the bill has 57 co-sponsors, both Democrats and Republicans. Contact your Member of Congress today and tell them to sign on to H.R. 5111 and prevent federal funding of abortion. Polls show that the vast majority of U.S. citizens are against federal funds paying for abortion. Make sure your Representative hears your voice by contacting him or her to tell them to co-sponsor H.R. 5111 because ABORTION IS NOT HEALTHCARE.